Themes in 2018 included reports on global economic growth and corporate earnings, record-low unemployment in the US, the implementation of Brexit, US trade wars with China, and a flattening US Treasury yield curve. Global equity markets delivered solid returns through September and had everyone hopeful for another positive year. However, the volatile sell-off in the fourth quarter left many investors wondering where markets are headed as we enter into a new year. The broad US Market lost –14.3 percent in the fourth quarter while the MSCI All Country World Index returned –12.78 percent. The increased market volatility in the fourth quarter of 2018 underscores the importance of following an investment approach based on diversification and discipline rather than prediction and timing. The sharp decline in the fourth quarter offset gains earned in the early part of the year, resulting in –5.24 percent and –14.09 percent respective drops in the U.S. Market and International Developed Country Indices for 2018. The market’s negative returns marked the end of nine consecutive positive annual returns. Despite the negative return this year, the US Total Stock Market Index has still produced a 13.1 percent annualized return for the 10 years ending December 31, 2018. GLOBAL DIVERSIFICATION – YOUR BUOY IN ROUGH WATERS. While markets around the world generally had negative returns in the fourth quarter, the dispersion in their returns highlights the importance of global diversification during market declines. When considering investing outside the U.S., investors should remember that non-U.S. stocks help provide valuable diversification benefits (see article “Why You Should Diversify”), and that recent performance is not a reliable indicator of future returns. It is worth noting that if we look at the past 20 years going back to 1999, U.S. equity markets have only outperformed in 10 of those years—the same expected by chance. We can examine the potential opportunity cost associated with failing to diversify globally by reflecting on the period in global markets from 2000­-2009, commonly known as the “lost decade” among US investors. While the S&P 500 recorded its worst ever 10-year cumulative total return of –9.1 percent, the MSCI World ex USA Index returned +17.5 percent, and the MSCI Emerging Markets Index returned +154.3 percent. In periods such as this, investors were rewarded for holding a globally diversified portfolio. FIXED INCOME HOLDS STEADY. Over the full year, the return on the U.S. fixed income market was relatively flat; the Bloomberg Barclays U.S. Aggregate Bond Index returned 0.0 percent. This was the closest any asset class came to a positive return for the year as all others had negative returns in 2018. In the U.S., the yield curve flattened as interest rates increased more on the short end of the yield curve relative to the long end. The yield on the 3-month U.S. Treasury bill ended the year at 2.45 percent; whereas, the yield on the 10-year U.S. Treasury note came in at 2.69 percent. ALTERNATIVE INVESTMENTS. Similar to other asset categories, the U.S. REIT index was down for the year -4.22 percent. The Bloomberg Commodity Index also continued to struggle, declining 11.25 percent in 2018. Wheat was the only positive category for the year, up 1.51 percent; unleaded gas fell 29.68 percent, coffee lost 27.93 percent, while sugar declined 27.53 percent. DESPITE CHALLENGES, WORLD ECONOMY REMAINS HEALTHY. Even with the end-of-year market sell-off, in 2018 the global economy continued to grow, with 44 of the 45 countries tracked by the Organization for Economic Cooperation and Development (OECD) on pace to expand. CONCLUSION. We are now almost a full ten years into the current period of economic expansion, the second longest on record, with the prior recession having ended in March 2009. All periods of expansion must end at some point, the big question is when? Most of the deterioration in U.S. economic data has been more subtle in nature. As we have stated before, better or worse on the margin tends to matter more than absolute good or bad data. 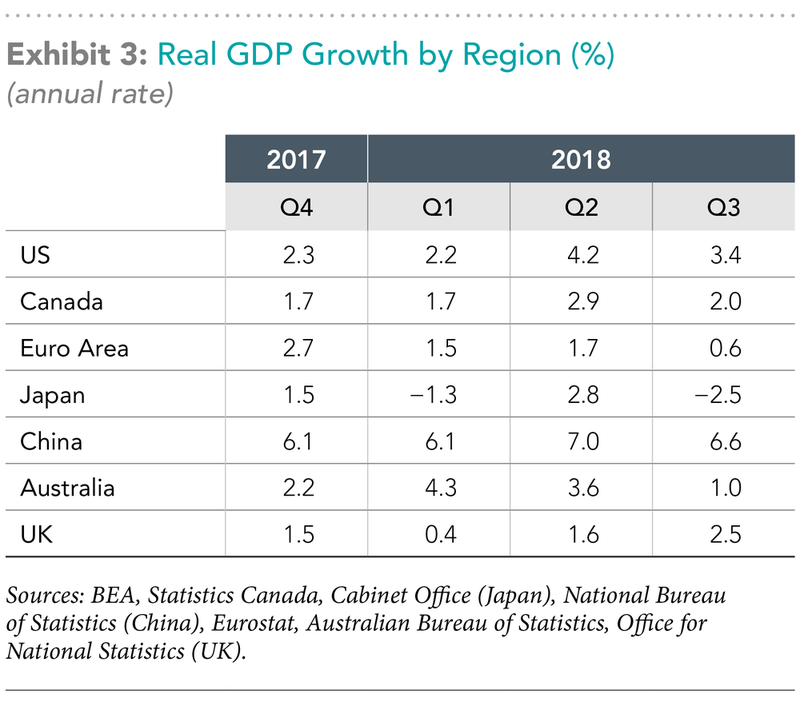 Although still growing, we do anticipate the U.S. economic growth rate to increasingly begin to slow from a recent high of over 3 percent moving towards 2 percent growth or lower this year. In line with economic growth slowing, earnings will have even tougher baseline comparisons in 2019. We have been lulled into a lower volatility environment over the last 24 months, the last three months of 2018 served as a bit of a wake-up call. For some this causes stress for what is perceived to have been recently lost. David Jones, Vice President of Dimensional Funds, paints an investment picture with a healthcare analogy to help us parse the depths of information we have available to us balanced with perspective through the lens of time and history. The brief article “Here’s the Prescription” is worth the read if only to settle our natural insecurities as we’re reminded that volatility is normal, part and parcel of investing. Over the last 40 years, the market experienced an average intra-year decline of nearly 14 percent. No one seems to complain about market volatility when stocks go up. 2018 highlighted the difficulty in predicting the performance of markets, the importance of diversification, and the need to maintain discipline if investors want to effectively pursue the long-term returns the capital markets offer. We greatly appreciate the opportunity to work with each of you. We recognize that each client’s situation is unique and incorporates different factors into their investment and financial plan. As always, if you have any questions or concerns about current market trends and the impact on your personal situation and plan, please contact us and we would be happy to discuss.